Who dreamed you would find the quintessential Colorado log retreat just minutes from the Denver Area? The moment you come up the driveway youâll see that dreams do come true. 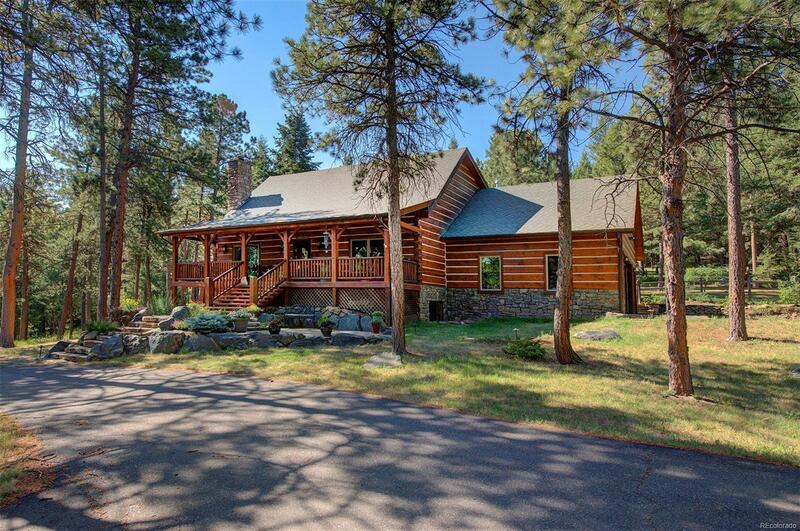 This stunning log estate was meticulously built by the current owners. Crafted with hand- hewn logs from St Ignatius, Montana, this home offers an open floor plan complete with spacious great room, a Chefâs Kitchen with Dacor ovens, Viking 6 burner and built in Liebherr fridge, casual coffee area plus a separate dining room with elk antler lighting. The master suite will amaze. The lower level walk out is perfect for entertaining with a party kitchen, more hi-end appliances, plus a true wine cellar! Outside enjoy peace and privacy whether sitting on the expansive front porch, dining on the flagstone patio or just walking your 5 acres. Thereâs room for all toys in the 3 car attached garage or the separate Barn with 2 more bays, heated workshop and finished space for a perfect man cave, workout room or office.